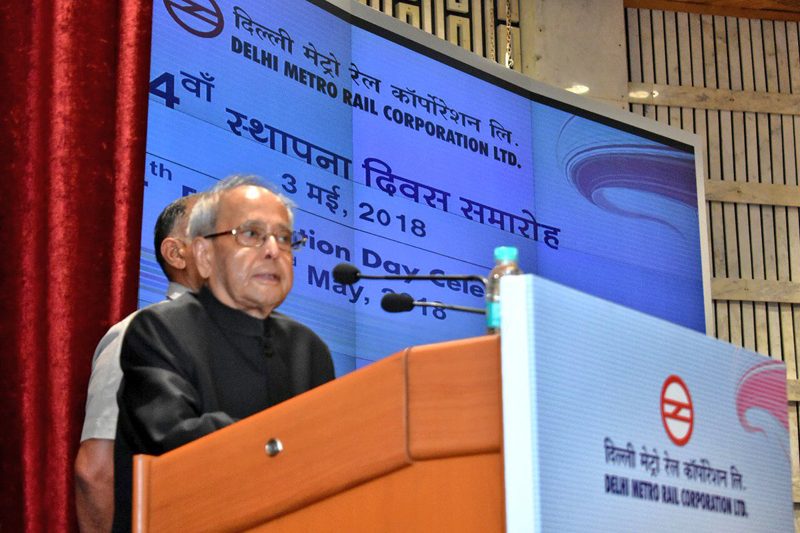 It gives me immense happiness to be present amidst all of you on the occasion of the 24th Foundation Day of the Delhi Metro Rail Corporation (DMRC). Let me begin by congratulating all the awards recipients today for their achievement. 1. In almost two and a half decades of its existence, DMRC has firmly established itself as one of the pioneering organizations in the country with a proven record in project planning, implementation and operation. 2. Today, it is a proud symbol of what modern India is capable of achieving. The Delhi Metro has shown the world that India is capable of competently executing complex infrastructure projects of mammoth proportions. Its massive expansion in the last two decades ranks among the fastest metro expansions anywhere in the world. This, indeed, has resulted in DMRC becoming a case study for many management programmes across the globe. 3. Back in 1995, when the foundations of the organization were being laid, nobody really knew how the project would eventually progress. There were innumerable challenges pertaining to issues such as the use of technology, availability of skilled manpower, availability of land etc. However, the enabling political leadership over the decades and the astute stewardship of Dr. E. Sreedharan ensured that all such challenges were tackled with great competence and the first and second phases of expansion were completed in record time. 4. Under his worthy successor, Dr. Mangu Singh, the work of the third phase of expansion is also nearing completion. I am informed that today, the Delhi Metro operates on a massive network of over 250 kilometers and will add over 100 more kilometers in the coming year. This is a very good achievement for an organization which started its journey only a couple of decades back. 5. There is no denying that The Metro has completely changed the landscape of Delhi. Now, movement across the National Capital Region has become far more convenient. Many areas such as Dwarka, Rohini, etc. within Delhi have become easily accessible and the markets of old Delhi which were suffering due to congested roads and poor traffic have got a new lease of life. The satellite cities of Gurugram, NOIDA, Faridabad and Ghaziabad are also connected by the Metro and I am informed that in the days to come, Greater NOIDA, Bahadurgarh and Ballabhgarh will also get Metro connectivity. 6. Reliable public transport is one of the most important pillars of sustainable and continued urban growth. For a city to grow, its people must have the convenience of travelling from one part to another without any difficulty. Delhi, due to its own burgeoning population and a disproportionately large number of vehicles (Over 10 million, as per the Transport Department Report of 2017; as compared to Mumbai which has around 3 million vehicles as on Jan 2017; Chennai with 3.7 million vehicle population in 2015 and Kolkata with just half a million vehicles in 2015) was facing this challenge for long. With many adjacent NCR cities also coming up, it had become imperative to develop a transport system which could carry a large number of people without clogging the traffic and Delhi Metro has successfully bridged that gap. 7. However, our urban planners cannot only focus on the expansion of public transport infrastructure. They must ensure that the expansion is environmentally sustainable. They must ensure that all the modern public transportation solutions are environmentally sustainable and do not aggravate the traffic situation on the roads any further. 8. On this count also, the Delhi Metro has done excellent work. According to a study, the metro services in Delhi have helped in removing over seven lakh vehicles from the streets of the national capital every day this year. As a result, many accidents have been prevented, fuel has been saved and vehicular emissions have reduced. This clearly shows that the sustainable public transport can go a long way in resolving many grave environmental challenges that our cities face every day. 9. I am told that all of DMRC buildings constructed as part of its Phase-III have been designed as green buildings and that DMRC is getting these buildings certified by the Indian Green Building Council (IGBC) for adherence to green building norms. I congratulate DMRC for this initiative. 10. Delhi Metro is also one of the pioneers among transport organizations globally in terms of solar power generation. Today, it is producing over 20 MW of solar power and is utilizing its premises such as stations, depots and residential enclaves for setting up roof top solar plants. It must also be added that the Delhi Metro is the first ever rail based organization in the world to claim carbon credits for its ‘regenerative braking’ and ‘modal shift’ projects under the United Nations Framework Convention on Climate Change (UNFCC). 11. These initiatives clearly indicate the firm resolve that the Delhi Metro has towards the conservation of the environment. In the recent years, we have seen how Delhi has faced grave pollution related challenges. Much like the Delhi Metro, other organizations should also incorporate environment conservation measures right from the planning stages so that the infrastructure that gets created is environment friendly. 12. The success of the Delhi Metro has almost sparked a Metro revolution across the country today. Apart from Delhi, 10 more cities in India now have operational Metro systems and many more cities are either planning or constructing their own Metro systems. While today, the combined length of Metros across India is 425 kilometres, in the coming days the number will cross the 700 kilometre mark. The Metro Policy released by the government recently will also aid the further progress of Metro infrastructure across the country. 13. I am also pleased to know that the Delhi Metro is leaving a mark even beyond the borders of the country. It is currently engaged as one of the consultants for the Dhaka Metro project in Bangladesh. It has also assisted Metro projects in Jakarta, Indonesia. Clearly, the Delhi Metro is leaving its imprints far and wide. 14. What sets Delhi Metro apart is its commitment towards values and ethics. In its ‘Vision, Mission and Culture’, the Delhi Metro announces that it intends to maintain ‘full transparency’ in all decisions and transactions. Punctuality is also given utmost importance and the trains are considered late if they reach behind schedule by even a minute. Because of its continuous focus on these aspects, the Delhi Metro has been able to create a work force that prides itself in upholding values such as honesty, commitment to work and punctuality. 15. Even as I talk about urban planning and public transport, I would like to underline that in Indian cities and metropolises, a single mode of public transport can never be feasible. For public transport to become fully effective, a multi-mode system, integrated seamlessly with each other will have to be planned and implemented. Apart from this, the efficient and cost effective last mile connectivity for the passengers will have to be ensured if the much desired shift from Private to Public transport is to be achieved. 16. Towards the end, I once again wish to congratulate the award winners and all employees of DMRC for making the Delhi Metro a world class organization and having helped in elevating India’s position on the world map. I wish the entire Delhi Metro family a very bright future ahead and hope that the organization would scale many new heights in the days to come.